While traditional bluegrass bands were (some still are) limited to male musicians, female bass players are fairly common in contemporary bluegrass bands; 7 time IBMA bass player of the year award winner Missy Raines is probably the most well known. In the world of string bands playing the wide assortment of folk/Americana/roots music, you’ll find that females are playing all instruments from the banjo to the upright bass. 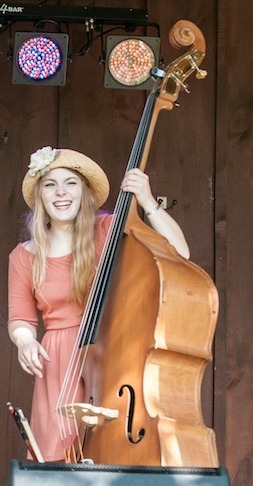 In May, 2013 The Barefoot Movement bassist Hasee Ciaccio demonstrated that height was not necessary to master the skill on the upright bass, and audience members were charmed by her personality, vocal quality and ability to add a complex bass line that enhanced the tunes. 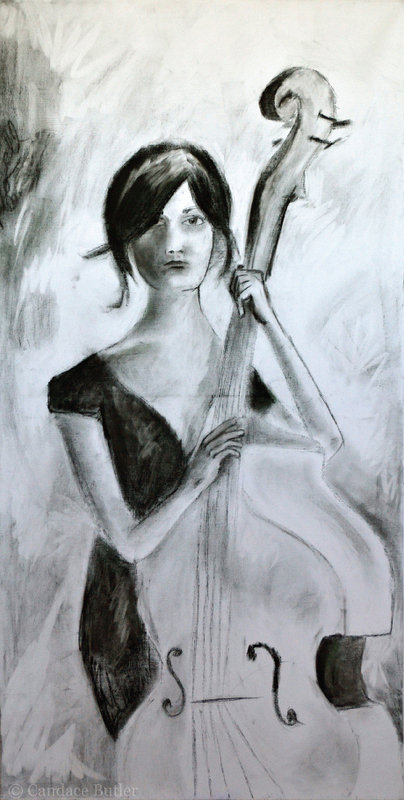 In December we had the honor of having bass player Shelby Means of the all female band Della Mae. Shelby joined Cruz Contreras and Josh Oliver as the Tanasi Ramblers for a few shows over the 2013 holiday season. Her upright bass is named Buddha and the two adeptly moved together throughout the evening’s set list with Shelby demonstrating her finesse as an accomplished musician. In upcoming shows we are excited to see bass player Vanessa McGowan of Tattletale Saints on April 4,2014 and Telisha Williams at this week’s show. Don’t miss vocalist and upright bass player Telisha Williams of the Wild Ponies when they perform at Chestnut House Concerts this coming Friday night, January 17. It’s our usual schedule of potluck at 6:00 p.m. followed by the show at 7:00 p.m. Call/text 717-940-9311 or email Tim at tlehman9@gmail.com to sign up. This entry was posted in For Your Information, Upcoming House Concert and tagged Americana, Candace Butler, Hasee Ciaccio, IBMA, Missy Raines, Shelby Means, Telisha Williams, upright bass, Vanessa McGowan by chestnuthouseconcerts. Bookmark the permalink.